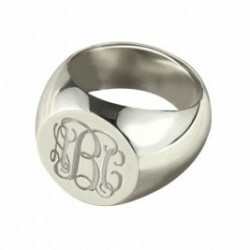 The ultimate in eccentric signet rings , this chunky, silver ring can be personalised with initials .. Wear any initial you want with our Initial Signet Ring - 18ct Gold Plated . This classic style.. Band ;Thickness: approx. min 0.6cm - max 1.3cm 1. Ring size comparison in different countries..
Face measures 10mm round and the ring has a depth of 2mm 1. Ring size comparison in different..